Square "Mother Teresa" is the end of the long boulevard that during the Italian occupation was supposed to shape Tirana's new fascist identity, the city centre taking the form of fasces. After fifty years of communist parades and the substantial abandonment experienced during the transition, this square has recovered its centrality following the visit of Pope Francis (it was September 2014 and the immense space was restored and polished) and the successful pedestrianisation. To this old, new square of Tirana the Earth Market has brought 50 stands of small producers and farmers from all over the Balkans, but also tastings, concerts, lectures, workshops, and a large outdoor kitchen, where some of the country's most renowned chefs cooked and entertained during the three days of the event. This year, Terra Madre was held in Tirana also because of the important contribution that Albanians chefs can bring to the Slow Food network. During the event, Slow Food president Carlo Petrini recalled how the Alliance Slow Food Chefs of Albania, created a year ago, is now expanding and connecting restaurants to small producers, with positive effects in terms of both tourism and export. 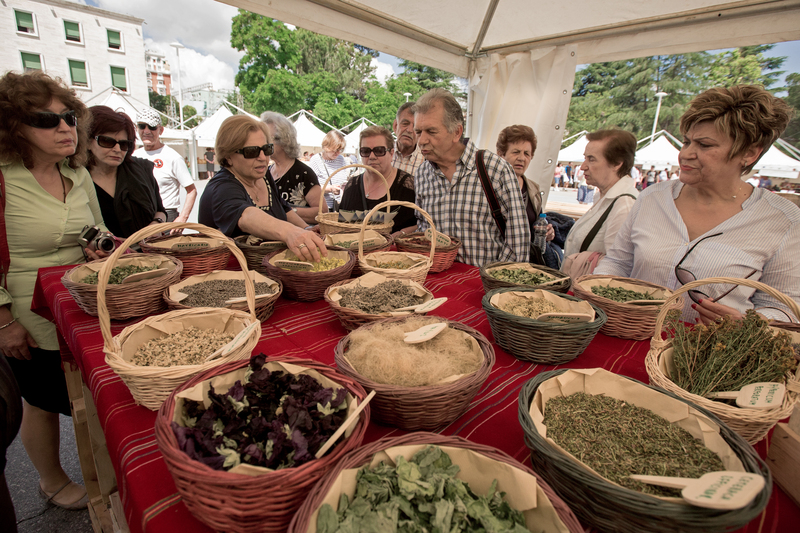 If movements like Slow Food are still struggling to take off in the Balkans – as explained by Michele Rumiz, Slow Food network coordinator in the Balkans – Albanian cooks have greatly developed the gastronomy of the country, in terms of both quality and relationship with producers. The aim of Terra Madre was precisely to "put farmers first" and explore the opportunities provided by access to markets and supportive policies, but also to encourage local producers to get out of the gray area of irregularity and make the transition from home production to artisan production – in other words, quality standardisation. In the perspective of Slow Food – and of the future European integration – the preservation of biodiversity also requires this formal adjustments. However, there are some challenges – taxes, the fear of having to raise prices and lose competitiveness, but also formalities that can be incomprehensible to the rural culture of Albania and the Balkans. The risk, as always, is that investments will not suffice to achieve the required standards. The issue of hygiene rules, at the centre of the previous edition, is as relevant as ever. As explained by Professor Sonya Srbinovska, in Macedonia one of the cheese factories had to redo afresh the building where they had produced cheese for over a hundred years, in order to comply with conformity standards. Unfortunately, in the aseptic splendor of stainless steel, the cheese does not taste the same. Pierpaolo Ambrosi – event coordinator, head of Vis Albania and, as his good mastery of Albanian language shows, engaged in cooperation projects in the country for over twenty years – helps us take a step back. Ambrosi highlights other issues, including the fragmentation of agricultural land: 86% of the properties have an extension inferior than two hectares. This prevents farmers from obtaining EU funds and, above all, a decent standard of living. Then there is the tipically Albanian issue of property titles, which often farmers do not hold, as well as the common resistance of post-socialist countries to come together in organisations that resemble the cooperatives of the past. "As long as the average size of the land stays like this, we are going towards a progressive abandonment of the countryside. The 80% of farmers will reach retirement age in ten years and in these conditions any generational change is unthinkable". Carlo Petrini also spoke of transmission and innovation, calling for the need for politics to devote more attention to agriculture, so that the ancient wealth and rooted traditions can be transferred from the older generations to the younger ones, "because tradition is nothing but continuous innovation in time and in ages". In the age of industrialisation and technology, stories of young people who choose to return to the land to grow and breed emerge with increasing frequency in Europe, but talking about "farmers by choice" in the Balkans is still premature. In countries where agriculture has not become an industry, there is still a tendency to hide one's peasant origins. This primarily affects thousands of urbanised families in Tirana and, together with the aforementioned bureaucratic and cultural problems, stifles the awareness of agriculture's potential. As pointed out by Dessislava Dimitrova, researcher and coordinator of Slow Food in Bulgaria, the lack of services in rural areas is demotivating. Families put children first – their education, medical services. "The atmosphere and the legal framework do not favour small entities", says Dimitrova. Many countries are struggling to create national policies, while European subsidiary directives get stranded in the ineptitude of the public administration. This is why we need to overcome that Balkan distrust and reluctance both to collaboration and the risk of private entrepreneurship, as any initiative was forbidden and punished for a long time. "The challenge is to understand that cooperation and friendship should not necessarily go hand in hand and take responsibility for one's own future", she concludes. Cooperation, both at the level of small producers and countries, was a big theme this year – an invitation to think about the cultural heritage of the region as a whole, not to erase differences, but to take note of the fact that often the problems are common and solutions can be shared. And why not think then, dares Prof. Srbinovska, of a "cross-border geographical indication" – as a sign of cooperation, certainly, but also in the hope of overcoming predictable diatribes on the "real" place of origin of individual products. The assets of our food and territory, it goes without saying, should help to establish the equality of all, not to celebrate the primacy of few. These are the theories. But what Tirana saw was a celebration that filled the square – the intense coming and going of visitors, the unique flavours from all over the region, the blaze of songs improvised by delegates. At the Kitchen Theatre, the clearing where for days the chefs took turns and cooked for hundreds of people, we talk to a "Don Quixote" of the kitchen and of the Alliance Albanian Slow Food. He does not want to be named, "we are all equal here, I'm just someone who learned life lessons from dreams". The anonymous philosopher insists on the need to use local products, but makes no secret of the problems, from the inflation of the denomination "Albanian organic product" to widespread pollution because of industrial discharges. But the main difficulty, he stresses, is just one – to make a choice between farming to earn and farming for quality and health. And this, he explains, is an individual choice: it starts from the dream, from within, from below. Today, Terra Madre is "below", and the battlefield is precisely at these latitudes. As 6 of the 12 million small farmers in Europe are now in the Balkans. Yet, according to Michele Rumiz, between 2000 and 2012, within the European Union, agriculture has lost 4.8 million full-time jobs, of which 70% in the new member states. "It is a war and we are losing," he warns. "If we cannot save small farms here, in the Balkans, where ever can we do that? ".